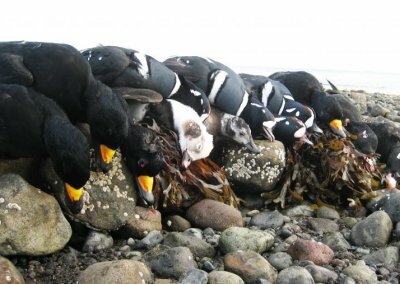 But first…it is a goal of many waterfowlers to hunt Harlequin, Eiders, Scoters and more in wild remote areas of Alaska. Let us help you fulfill your dreams of an unparalleled hunting adventure for sea ducks, Brant and more in the world-famous Cold Bay and Izembek Lagoon area. 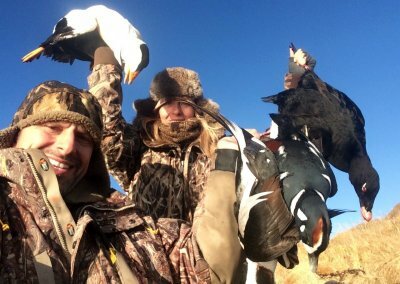 Nowhere else can one hunt for such a wide variety of species and also utilize the finest gear while enjoying the comforts of a fully modern lodge designed for waterfowlers needs. 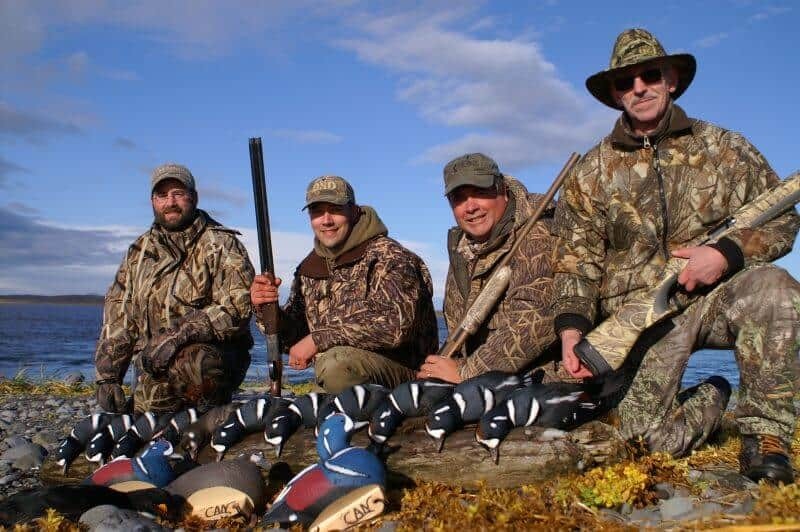 Leave your worries behind and trust in our 15 years experience of hunting Cold Bay and our commitment to providing the best waterfowl hunts possible. Captain Jeff Wasley has spent every fall since 2002 in Cold Bay and we own our home and lodge in Cold Bay. No other guides have offered sea duck hunts in November and December in the Cold Bay area. 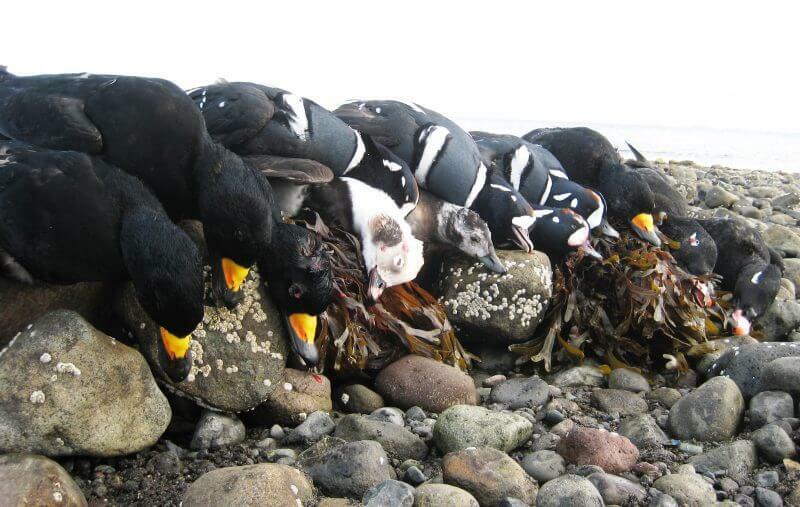 We hunt the Cold Bay/Izembek area from September 1st through December 16th. 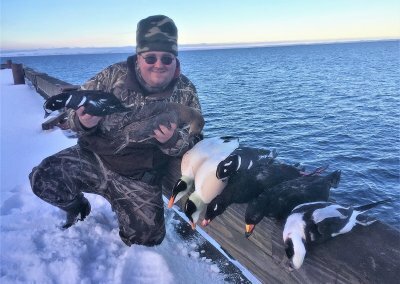 Jeff also guides on St. Paul Island December 27th through January 22nd. 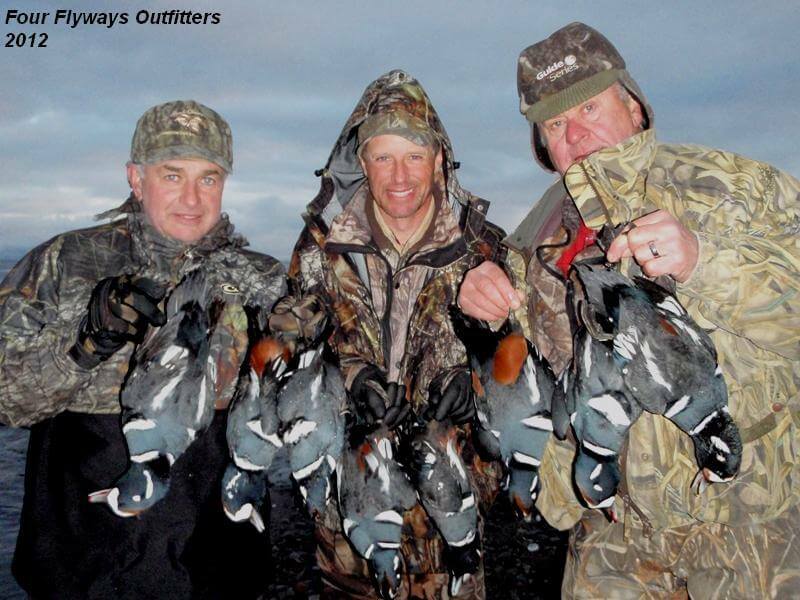 Jeff also has guided for Snow Geese the past 10 springs in South Dakota. 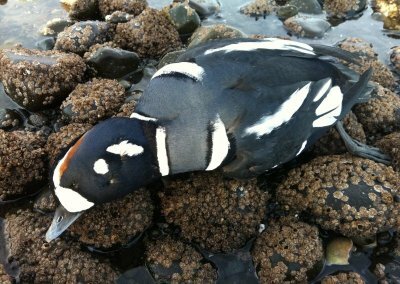 We guide 150+ days a year for ducks and geese. Our experience is simply unmatched. We are waterfowlers to the core and know how to produce the best hunts. 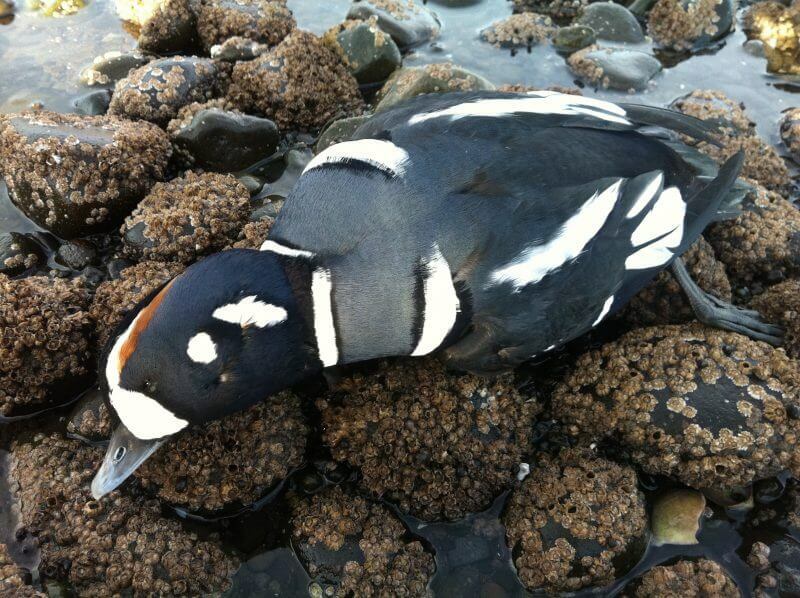 We are 100% focused on ducks and geese and are not sidetracked by big game or fishing businesses on the side. 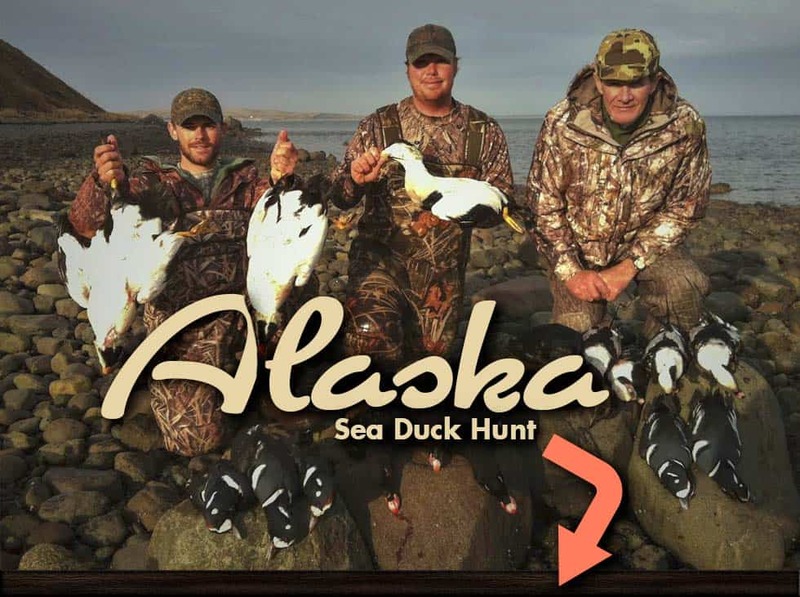 Do not be mislead by fly-by-night guides and their confusing websites, do your research and contact the US Fish & Wildlife Izembek National Wildlife Refuge office (907-532-2445) and ask them which guides have been operating in the Cold Bay/Izembek area during the past 10 years. 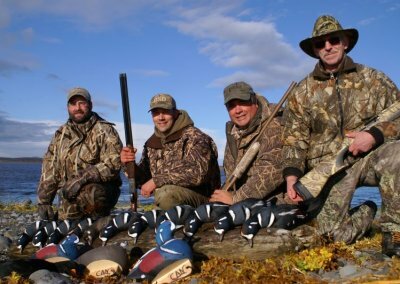 We have continued to invest in our hunting gear, vehicles, safety equipment and boats, which are all permanently located in Cold Bay. We successfully guide our guests to over 20 species of waterfowl each year and have all the required gear and transportation needed to have great hunts and get you back safely. 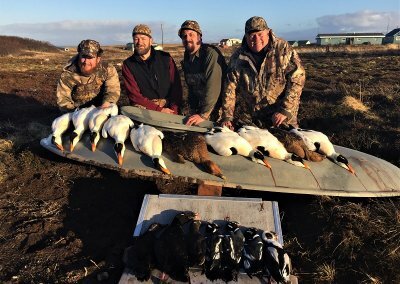 This abundance of gear allows our hunters to hunt in a wide variety of environments and also try new styles of waterfowl hunting including layout boats, large ocean going vessels, etc. 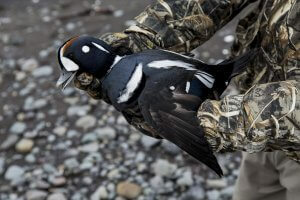 No one else comes close to our investment in waterfowl gear in Cold Bay and beyond. We operate in an extremely remote area and the safety of our guests and ourselves is always top priority. We have a 100% safety record and our staff members are all accredited with CPR and first aid. 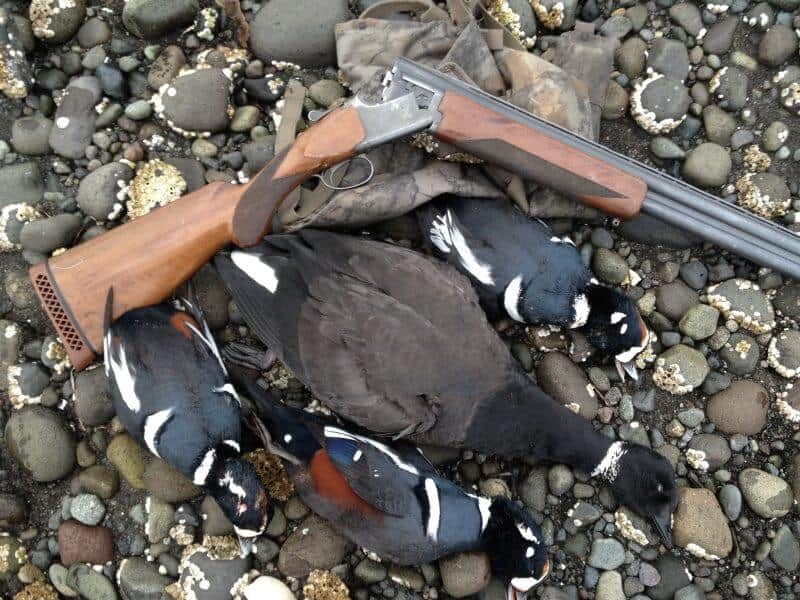 We pride ourselves in conducting our hunts with a commitment to being 100% legal, ethical and safe. 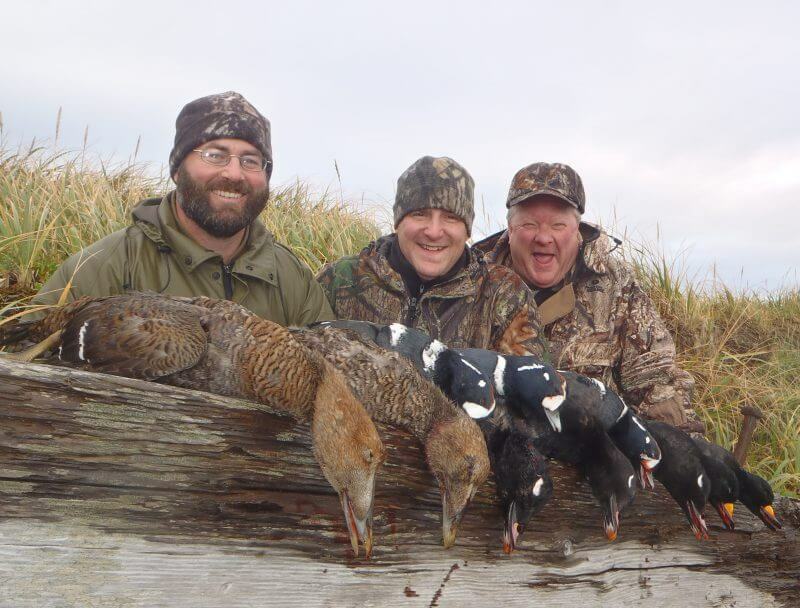 We want our hunters to rest assured that they will have an outstanding Alaska hunting experience and not have any worries while hunting in a challenging wild area. With a modern lodge that was completely renovated in 2016 you can rest assured that you will have a comfortable and welcoming “home” away from home. 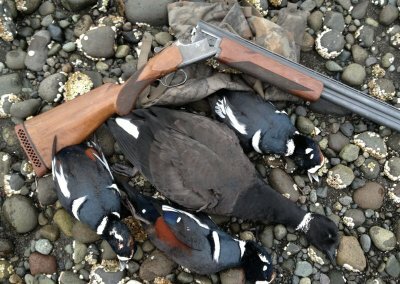 We have all the amenities a traveling waterfowler needs and then some. We have huge mud/utility rooms to ensure that your gear will be dry and warm every morning, while also providing a spacious area to get dressed for your adventures. The heated mud rooms also contain a washer and dryer, boot dryers, freezers, gun cleaning table and sink in addition to ample hangers to keep your gear organized and ready to go! Our guests can also expect hearty flavorful meals to keep them fueled up for their adventure. In addition, our lodge has a large lounge area as well as 2 full bathrooms with plenty of hot water for everyone! 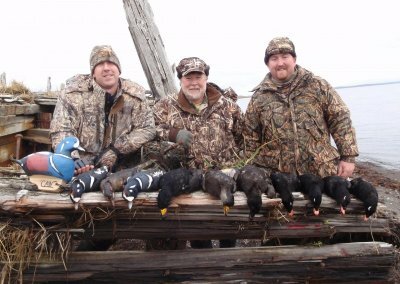 Our results are unparalleled and are the result of our 100% commitment to producing the best duck and goose hunts in Alaska. 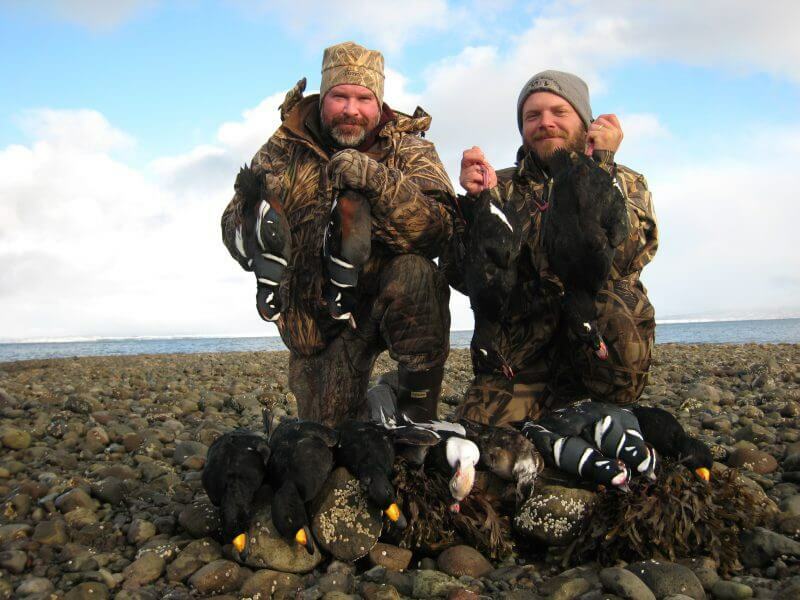 Four Flyways Outfitters pioneered guided sea duck hunting in the Cold Bay/Izembek area. 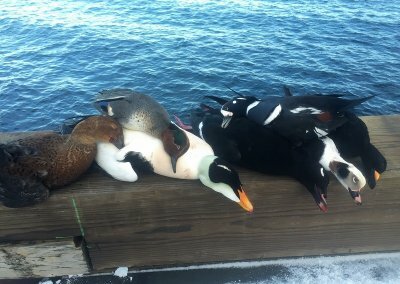 Our hunters have taken more Pacific Eiders in one season then the rest of the other guided hunters in the state combined. 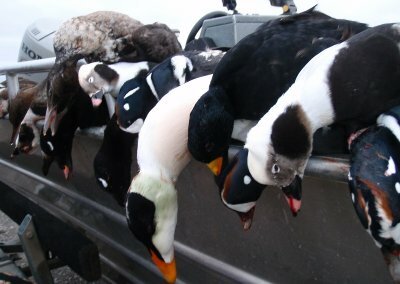 We will continue to produce the best combo sea duck, Brant, and other waterfowl hunts for our guests. Our photos do not lie. Please check out our Alaska Eider Hunting photo gallery where all of our pictures are 100% legitimate proof of our guests hunting for Pacific Eiders out of our Cold Bay lodge and for King Eiders during our January hunts on St. Paul Island with Alaskan Eider Outfitters. Our testimonial page is full of past hunters who have had great hunts with us. 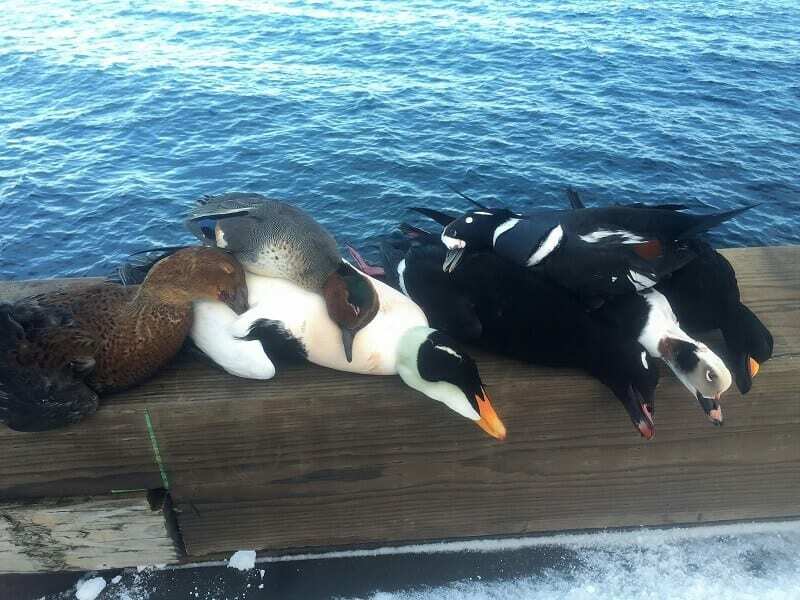 From 2009 to 2016 we have had 82 hunters get mature Pacific Eiders in the Cold Bay area and no other guides have produced any results for these birds in this location. Contact us today for more information on our hunts.